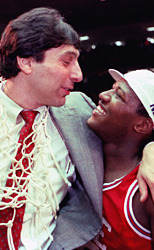 In 1983, the NC State Wolfpack, coached by Jim Valvano, stayed alive in the postseason by winning nine do-or-die games in a row -- seven of which they were losing in the final minute -- beating the likes of Michael Jordan and three-time National Player of the Year Ralph Sampson. The unlikely squad made it to the national championship game against No. 1 Houston, aka Phi Slama Jama, a team featuring future NBA Top 50 all-time players Hakeem Olajuwon and Clyde Drexler. NC State was one of the biggest underdogs ever in the final game, one that went down as possibly the best college basketball game in history-ending with one of the most well-known plays of all time. During the summer of 2011, I received a phone call from Dereck Whittenburg. We met a few years earlier when he was the head basketball coach at Fordham and I helped him set up a TV show about the team. He was an amazing guy, I remember thinking, 25 years out from his great shining moment and still so passionate about the game. His great moment -- and any fan of a certain age will remember it as one of the great flashbulb memories of a lifetime of fandom -- was hoisting up a desperate prayer of a ball that was caught and dunked by his teammate, Lorenzo Charles, giving their NC State Wolfpack the unlikeliest NCAA Championship victory imaginable. This was the moment that the NCAA Men's Championship Tournament became March Madness, the miracle that made college basketball a highlight of the sports calendar right up there with the Super Bowl and the World Series. That happened in 1983, and here it is 2011, and Dereck is calling because it's almost the 30th anniversary of the moment. He's been thinking about it, and he wants to make a film about it. Now a broadcaster, neither playing or coaching for the first time since he was a little boy, Dereck is taking stock about what that championship -- that run of perfection -- meant to him and his teammates. They'd lost their beloved coach Jim Valvano just ten years after the title, but still they were a kind of family, and Dereck wanted to get them all together to remember. He didn't know it would happen so quickly. Two days after we spoke, the news hit the wire that Lorenzo Charles, a bus driver in Raleigh, had died in a crash. Dereck and his teammates gathered not to celebrate their championship season, but to mourn the loss of the man who had delivered it. Suddenly, everything that had happened so long ago meant something new. The year and a half that Dereck, producer Jim Podhoretz and I have spent journeying together has been incredible. Jim and I were both in college watching Dereck win the title in 1983, and what the three of us have discovered together about time and memory, about purpose and perfection, about friendship and loss, has been a journey for which I'm deeply grateful, both in the living of it and in the ability to share it in our film. "Survive and Advance" is about a team of destiny, led by a once-in-a-generation coach, that capped the last true golden age of college basketball. But more than that, it's a story of how people find meaning in life, and how a team sport, when played and practiced with purpose and commitment, can turn a team into a family. Dereck likes to say that he and Valvano shared a vision. "A vision is a dream with a plan," he says. But ultimately, we don't know what the plan is for each of us, so when the dream comes true, it means so much, even 30 years later. Jonathan Hock is an eight-time Emmy Award winning producer, director, writer and editor. 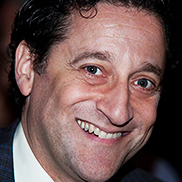 Over the course of his 25 years in television and film, Hock's hundreds of credits have ranged from primetime network programming to independent fiction and nonfiction film. His recent film, "Unguarded," was named Best Documentary of 2011 by Sports Illustrated, and the LA Times film critic Patrick Goldstein wrote that the film has "as much scope and ambition as any of the great novels or stories." In November 2010, Hock's "The Best That Never Was" premiered to wide acclaim as one of ESPN's Peabody Award winning "30 for 30" documentaries. Previously, Hock wrote and directed the feature-length documentary "The Lost Son of Havana" and "Through the Fire," both of which also aired on ESPN. For television, Hock created and directed ESPN's award-winning "Streetball," which was the longest running sports reality series. Hock is currently at work on a series of shorts called "Hockumentaries" for Grantland, the first of which, about Royce White, has been viewed over a million times. Hock founded The Reel People Film Project, a program of film workshops for at-risk youth in New York City. It was during one of these workshops, in 1995, that Hock met a 15-year-old student named Alastair Christopher from the Farragut housing projects in Brooklyn. Christopher, now 33 years old, was Hock's award-winning DP since "Through the Fire." Hock lives outside New York City with his wife Lynn and sons Eddie (13) and Joseph (8).